The first thing you hear once the small plane has landed on the beach is the howling. Fraser Island, off Australia's northeast coast, is home to some 160 dingoes  wild, dog-like cousins of wolves  which share the World Heritage-listed island s pristine beaches, dunes and rainforests with about 200 residents, and around 350,000 tourists a year. 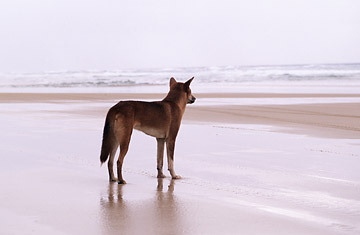 The dingoes are a protected species, and isolation has kept them genetically pure. But authorities fear they are growing far too comfortable around humans, and humans around them. Dingoes regularly lope near homes and campsites, where people often toss them scraps. That, authorities say, emboldens the animals, sometimes with disastrous results. In 2001, a nine-year-old boy walking on a beach was set upon by dingoes and killed; his seven-year-old brother was badly mauled. The Queensland state government ordered a cull of dingoes found near human settlements, and has since tried a variety of ways to keep the animals and people apart. Wildlife rangers have been armed with chemical sprays, pellet guns and slingshots. People caught feeding dingoes are fined. No attacks have been reported since a toddler was bitten in late 2006, but officials fear that if people keep treating dingoes like pets, more humans will be hurt  and more dingoes will be shot. In the 1880s, Australians built the world�s longest fence, stretching 3,400 miles, to stop dingoes attacking sheep in the country�s southeast. Now, Fraser Island is to have its own dingo fences  designed to enclose the humans and leave the rest of the island to the animals. "It�s a reverse zoo. It's like a concentration camp," says resident Joanne McKay of the six-foot high wire fences being erected around the island�s two hamlets, Happy Valley and Eurong. McKay and dozens of residents and tourists vehemently oppose the fences, which they�ll be able to cross only through spring-loaded gates. "I like to take visitors past the fence and say, Look at the new zoo," McKay says. "When they ask, Where are the animals?, I point at people and say, Look, there's one." McKay believes the dingoes are generally harmless. She never feeds them, she says, but she's named the ones that regularly roam her garden. "That's where Granny likes to sit," she says, pointing to a well-worn patch beside her porch. "And Biff the big male sits way over there." McKay thinks the fence is misguided, and that the $700,000 it will cost would be better spent educating visitors about dingoes. But local MP Andrew Macnamara says residents' relaxed attitude is a large part of the problem: "Persistent illegal and reckless feeding of dingoes in townships," he says, has led to "habituated and aggressive animals that pose a threat to humans and particularly children." In more than two years of studying the island's dingoes, animal behaviorist Rob Appleby has spent thousands of hours filming them scavenging, breeding, playing and fighting. But he's never been so much as nipped, he says. "I only felt nervous once, when I was near some puppies and four adults surrounded me." He sat down and remained as still as he could until they went away. Some islanders doubt the fences will keep the dingoes out: it's rumored that they got through the electrified barrier around a local eco-resort by waiting till the batteries ran down. That might be a tall story, but Appleby says there's no question dingoes are resourceful. In a recent research video, a parcel of food was placed high on the wall of a cage, just out of reach of a dingo inside. After several unsuccessful leaps, the animal dragged a table to the wall, leaped on top and, standing on its hind legs, grabbed the food. "I'll be telling National Parks not to leave any tables around when they build the fence," jokes Appleby. The real trick might be getting residents to accept their cage.